Very briefly, when the UK moved from purchase tax to VAT, cake was already designated as a staple food. No sugar debate in those days! But biscuits were treated as a luxury item in your shopping trolley and taxed. In 1991 the UK revenue people decided that Jaffa Cakes were a chocolate covered biscuit and and we should all pay VAT on them. Twenty years of battling and a court case gave McVitie’s the victory. A very smart QC acting for the company explained that a biscuit goes soft when left out in a room but a cake becomes harder. 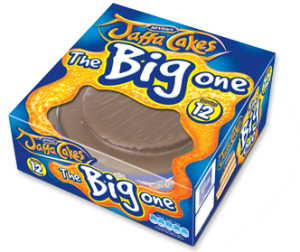 They made a 12 inch Jaffa Cake for the court to prove the point. I’d love a 12 inch Jaffa and it’s on its way! Anyway, the big Jaffa did go hard and not soft and the case was won. Personally I would tackle this issue from a more scientific standpoint. I’ve not actually done this so I am guessing, but if the Equilibrium Relative Humidity (chapter 3 of my eBook A Wet Look At Climate Change) of the sponge in a Jaffa Cake was measured then I would expect to find that the value was generally much higher than ambient humidity. This means that at most normal room conditions the Jaffa sponge will lose moisture to the air. However, if we did the same with a biscuit, the opposite should be found, and under the same conditions, it will always adsorb moisture. A consequence of the Jaffa sponge losing moisture is it becomes harder as it dries. Whereas, the biscuit taking up moisture, becomes soft. Well, I’m off to have a cuppa and one, or two or three wee Jaffas….. If you would like to hear more about moisture and relative humidity in everyday life, please sign up for email alerts of my blogs.